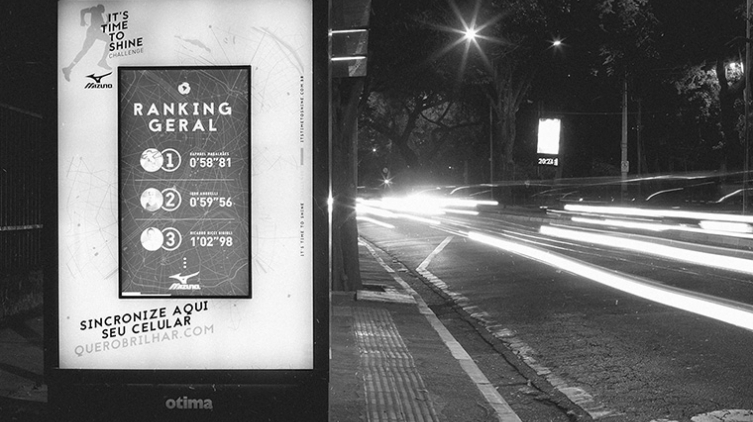 To participate, all you had to do was go to the track — between Gates 6 and 7 of Ibirapuera Park in São Paulo — and access the querobrilhar.com website by cell phone. After connecting to one of the bus stops, the person needed to run 450 meters to the other stop. "This was another innovative initiative by Mizuno to surprise street runners and help them shine even more. Our idea was to support and promote the practice of running - one of the most democratic forms of exercises," says Rogerio Barenco, executive manager at Mizuno in Brazil. In the official website of the challenge - www.itstimetoshine.com.br – runners could see the ranking of the day and overall ranking, compare running stats, and challenge friends. “Running on the street is part of the life of runners. What we did was imagining a virtual track and make it real” adds Theo Rocha, Creative Director for F/Nazca Saatchi & Saatchi. The activation is signed by F/Nazca Saatchi & Saatchi, and street furniture by Otima.